On the day Palestinian Authority chief Mahmoud Abbas spoke at the UN of finalizing an agreement with Israel, essentially recognizing Israel's existence, a speech he had written for an event in the Palestinian Authority (PA) lavishly praised a PA terrorist whose actions murdered and injured dozens of Israelis. The paradox was uncovered by the Palestinian Media Watch group, which compared the speech Abbas made at the UN on September 27, to remarks he prepared for an event on the same day that celebrated the life of Ahmad Abu-Sukar, a notorious terrorist best known for his 1975 “refrigerator bomb” attack that killed 15 and injured 77. 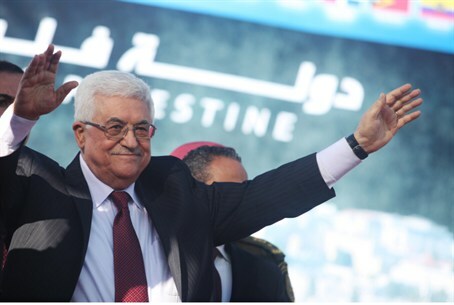 But as Abbas was making his UN speech, PMW said, another speech, prepared by Abbas and read out at by PA top terrorist Jibril Rajoub at an event in Abu-Sukar's memory, called the terrorist a “hero,” a “legend,” and a “trailblazer” who showed PA Arabs the proper attitude to Israel. “Abu Sukar,who with the sweat of his brow and his faith showed us the proper path, with his unforgettable and unbelievable action, is deserving of being called a great hero, who is deserving of all honor and respect. I say to his fellow villagers and his family – you may have lost a hero, but we, his colleagues, in Fatah and the other national movements have lost a torch who led us. I cannot describe how Abu Sukar lived like a giant, and died like a giant,” Abbas said. During the ceremony, members of the terrorist's family received a special award from Rajoub, awarded in Abbas' name. Abu Sukar, whose real name was Ahmed Jabara and was of American-Arab background, set off his refrigerator bomb in Zion Square in Jerusalem. Israeli forces captured him, and released him from prison in 2003. He died last July of a heart attack, and was given an official funeral with full military honors.